The idea has been tossed around in science fiction yarns for years now, but researchers at Radboud University Nijmegen in the Netherlands have actually found a way to read people's minds. Or, more specifically, decode what letters of the alphabet a subject is looking at by analyzing MRI scans with a special mathematical model they developed. Freaky. 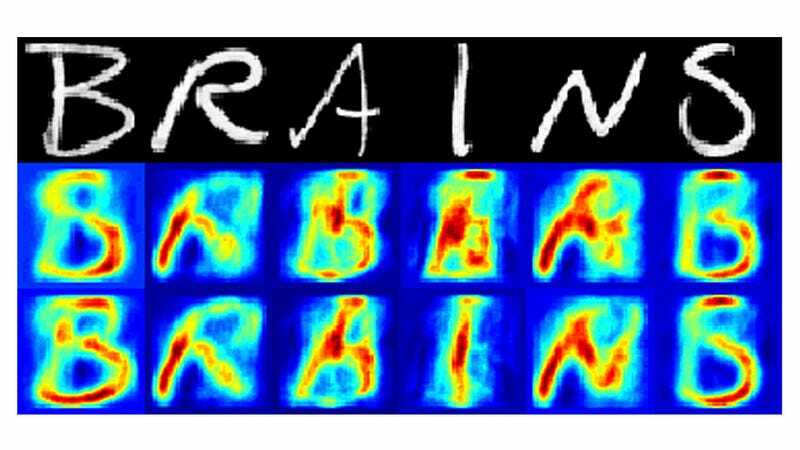 The image suggests that the researchers have found a way to discern actual letters from a subject's brain scan, but that's not entirely accurate. What the scientists did was to break up MRI images of a subject's visual cortex into 1,200 small cubes that would randomly light up when the person was looking at a specific letter of the alphabet. Except that it wasn't actually random; the individual segments would light up in the same pattern again and again for a given letter. And this pattern allowed the researchers to teach their model to then recognize what letter was being visualized. The mathematical model then went one step further, manipulating the results of the MRI scan so they looked like the letters of the alphabet we'd recognize. It might seem like cheating, but the approach was actually similar to how humans quickly recognize things based on memories of having seen it before—a phenomenon known as prior knowledge.